SIFF is actively recruiting volunteers for the 43rd Seattle International Film Festival, May 18 – June 11, 2017 and is excited to be in Shoreline again this year from May 26 to June 3. 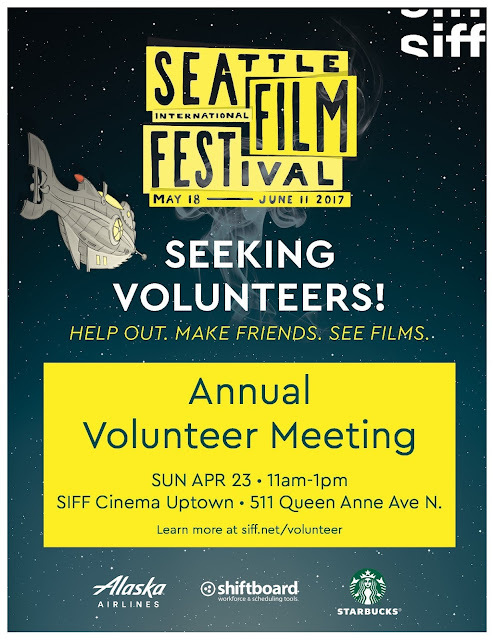 We will officially kick off this year’s festival with our Annual Volunteer Meeting on Sunday, April 23, 11am to 1pm at the SIFF Cinema Uptown, 511 Queen Anne Ave N.
We are pleased to extend an invitation to you and yours to join us for the 2017 SIFF Annual Volunteer Meeting. Additionally, we'd love to collaborate on group volunteer opportunities during the festival itself - between May 18 and June 11, 2017 - on the SIFF Venue Crew. We are looking for groups of four to six volunteers who all are at least 16 years old by May 18, 2017. Venue Crew volunteers are the Face of SIFF. They work at the different theaters serving as the on-site staff who provide line control, scan tickets and passes, clicker count patrons, hand out ballots, and usher guests to their seats. An average volunteer shift is four hours. Shifts are typically scheduled Monday through Thursday between 4pm and 10pm, and Friday through Sunday between 10am and 11pm. Shifts are scheduled based upon programming needs. We can coordinate the preferred day, time-frame, and location. To schedule a group volunteer opportunity, complete and return the Volunteer form by April 15.